We all likely have a favorite set of applications we think are excellent, and we use them over and over, by choice. And there’s some we may be forced to use – for example, for business purposes, or the financial app for your bank. We may not like the ones we’re forced to use, but there may not be much choice - unless you want to switch banks or employers. However, where there is choice, one person’s idea of the perfect experience is sometimes another’s nightmare. Millions of people love Spotify, but millions of others love Pandora or Apple Music. Much of that is based on UI and UX. SEE ALSO: How Much Time Are You Wasting Programming Crestron Systems? What does that have to do with home automation? Plenty. Our industry sells the promise of the smart home that you can control with a touchscreen, a remote, or maybe your voice. The user also wants to know that the “automation” part of home automation is working correctly, and that’s part of UX design. Having that experience be a positive one involves good UI and UX. But we know that what we may think is a beautiful, intuitive design may be a confusing mess to a client. In software development, the Agile methodology is widely employed for development of everything from mobile apps to enterprise software. Generally, it involves doing small chunks of functionality at a time, getting user feedback, and iterating on that chunk and adding more functionality. The premise is that you don’t spend months or years designing and developing an entire system and when finally presented to the users, they hate it. To do Agile design well, you need tools that enable flexibility, so you can garner user feedback and change things quickly. That flexibility is a critical part of our goal with ADAPT. We know that Crestron systems are powerful and highly configurable. We also know that they are not easy to program, which is why we developed ADAPT. From a UI perspective, ADAPT has templates that are easy to use and customize for a client. You can use the preconfigured ones we supply, or change buttons, colors, and other elements without programming. 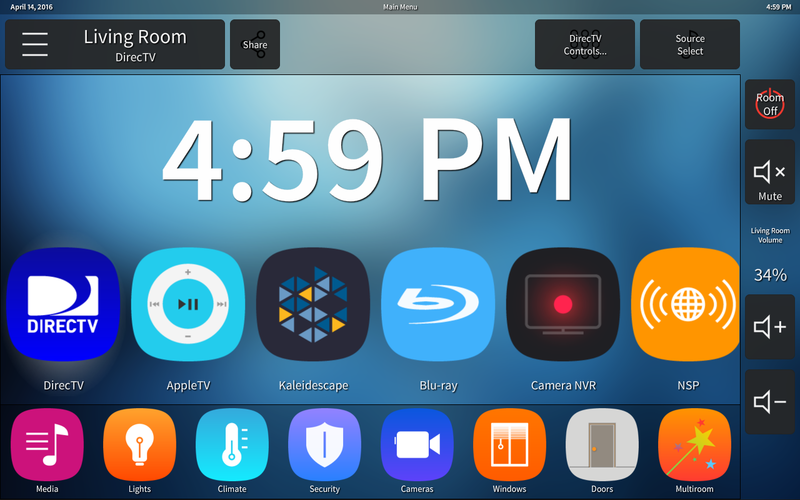 The flexibility to quickly change UI design gives you the ability to bring an Agile-like approach to home automation programming. Don’t take our word for it – this video demonstrates how easy it is to adjust an interface. Home automation interfaces should be relatively straightforward and not confusing. There’s an art to surfacing enough control for the user while hiding complexity. For example, some users might want to change surround sound modes in their media room or theater receiver or processor. You want to make it easy enough for one person in the client’s family to find but not everyone, so they don’t change things and get frustrated when a different audio source doesn’t sound right. Those are the types of design decisions that a good tool can help you quickly create, show the client, and get right. When a client says, “I don’t like that interface,” it’s essential to dive deeper into what they don’t like. Was it the layout of the buttons? The colors? The fonts on the labels? Or the navigation, as in “how do I change the surround mode on the receiver?” If you have a flexible tool like ADAPT to change those things without hours of work, you can profitably deliver the UX the client wants. Want to learn more about how ADAPT can help you design the experience your client wants? Reach out; we’d love to show you.